Brad Spelich and Abby Zukowski congratulate Karen Sterchi. 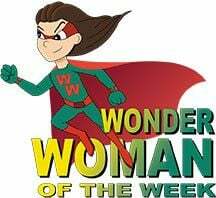 99.3 WAJK's Wonder Woman of the Week for 4/17/19! She's loving and strong and fiercely loyal. She's a provider and a caretaker. She's always there when you need her. For all she does, 99-3 WAJK, your Peru Hy-Vee, Balanced Spirit Wellness Center and Shaker's Lounge salute the Wonder Women of the Illinois Valley! Every week we honor one of these amazing women, and give her $25 gift cards from Balanced Spirit, Hy-Vee and Shaker's. Click here now to nominate the Wonder Woman in your life. Brad & Abby pick a winner every Wednesday morning. Our third Wonder Woman of the Week is Karen Sterchi! Karen is the operator of Karen Kares Doggie Daycare in Mendota. She's also a dedicated and friendly home healthcare provider! Shoutouts to you, Karen, for being a 99.3 WAJK Wonder Woman of the Week! Big thanks to our Wonder Woman sponsors! Winner must be a legal U.S. resident at least 18 years of age. There's no purchase necessary to enter or win. Winners are determined via random drawing of all qualified entries. Employees of LCBC, participating sponsors and other media and their immediate family members are not eligible to win. Winner's likenesses will be used for promotional purposes. Sponsors and prizes may change at any time. LCBC reserves the right to substitute a prize of equal value. Contest may end at any time.